Have you ever heard a child sing “Old MacDonald” at the top of his lungs, over and over, while you’re stuck in traffic and an hour late getting the kids’ dinner started? If you haven’t, we’ll call you the lucky one. That makes me the unlucky captive audience member, and it’s an experience I hope not to have again. The boy needs some pointers on pitch and harmony before we can try any song again. Enter The Bingo Song HD. 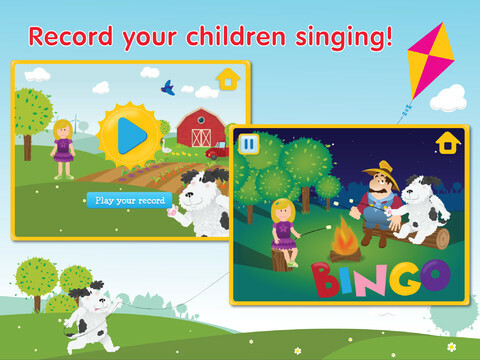 Part early-reading skill builder, part karaoke machine for your kids, this app puts a popular nursery rhyme into song form. There’s also a fun trivia game where players tap illustrated cards to answer trivia questions. On each screen there are fun interactive surprises revealed when tapped. The best feature about this app is that both sections – singing and trivia – have a record option. In the singing section the background music and words to Bingo are provided for players to follow. Players are given a little over a minute to record the answers to the questions on the back of the illustrated trivia cards. My kids – 3 and 5 – love singing along to whatever song might be playing at the time. They know the words to Bingo quite well; it’s a good thing they do because this app doesn’t narrate the lyrics. I had to show them how to record the songs and how to get to the trivia game. Once they figured it all out, though, they were able to play independently. 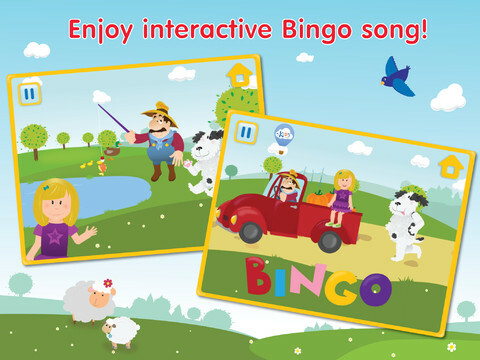 The Bingo Song HD lays the foundation for a great app but falls short in a few areas. For a download price of $2.99 there should really be more songs an easier-to-follow directions. With some tweaks this app could be something really worth singing about.